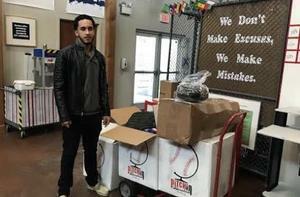 Steven Grullon's Home Run Against Poverty! Dropping temperatures signal that it’s the season for change. We’re all adjusting to Winter’s first blast. We’re anticipating Christmas. Seniors are contemplating post-graduation plans, but before they can get there graduation requirements must be met, Senior Thesis Projects (STPs) have to be buttoned up. Meet Justice student, Steven Grullon, owner of Endless Graphics, a design focused printing business based in the E-Center. His STP is to travel to San Cristobal, Dominican Republic, following his interest in baseball. But his trip won’t be a vacation. 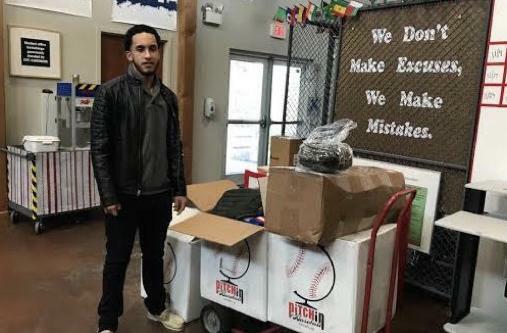 Instead, he’ll deliver new and used baseball equipment – hats, cleats, gloves, uniforms, bats, and more… all donated to a nonprofit in DR.
His donors seem to be coming from every walk of life: individuals, colleges and universities, high school coaches, and even semi-pro sports teams. Steven has been fundraising on GoFundme, (linked below) and soliciting these donations. With several months still to go, Steven has alread raised awareness for his project and colleted about $3,000. While we all freeze in Rhode Island, Steven will head to the Dominica’s warm breezes in February or March. Christmas will come late to the little island, but when it comes, young baseball fans will get gifts they’ve only dreamed about. Please to share this with your friends and families to spread awareness for our students (especially Steven) and their outstanding work. The E-Center Blog is written and curated by Layla Alves, Grade 11, Justice.